Wondered How Pusha T Got The Jay Z Feature? 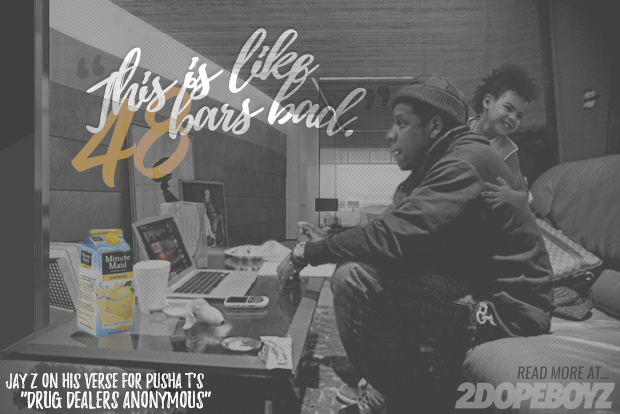 Tuesday morning, Pusha T shook the music world when he announced JAY Z joined him on his upcoming King Push single. A couple hours later, the two murdered DJ Dahi’s ominous, warbling production on “Drug Dealers Anonymous” as they hit rewind back to the days of cooking up in the kitchen. But how did Jay and Pusha, who never appeared on each others songs — they’d only joined on Kanye’s “So Appalled” — finally come together? Well, it was as simple as a couple emails, apparently. Speaking with Genius, Pusha said after a studio session with Kanye, who is working on a G.O.O.D. Music albums (yes, Cruel Winter is still a thing, it seems), he simply sent an email to Jay saying he left him some extra beat at the end of his verse if he wanted to do anything with it. The news reporter that called you a 14-year drug dealer, this was the inspiration behind it. Here’s my verse. I left some extra beat for you. Let me know what you think either way. Man, there’s nothing wrong with telling ghost stories. We need them. We love them. We love these things. Oh this is going to be bad. Oh this is going to be real, real bad. I’ll just blame it all on you. This is bad bad. This is like a lot of bad. This is like 48-bars bad. And that’s how two of coke rap’s largest preachers came together for the first time, in the later stages of their career no less: email. I still find just the thought of JAY Z opening up his phone and responding promptly to emails after closing Twitter, where he just saw a barrage of “Damn Daniel” compilations, pretty far-fetched in the absolute best way possible. JAY Z, really, is just a dad who is trying to be “with it.” He can just heat up the rap world on a moment’s notice, too.